Saturday 10 August 1pm Fancy “three courses” of hearty discussion about life and death? The Death Cafe is a world wide movement that aims to make it easier to talk about death, with a view to helping people make the most out of life. The first Blue Mountains Death Cafe is timed to follow the 11am screening of Goya: Crazy Like a Genius made by Robert Hughes in response to his near-death experience. Blue Mountains Death Cafe is a collaboration between The Groundswell Project and the Blue Mountains Cultural Centre. Dying to Know Day is an annual day of action dedicated to bringing to life conversations and community actions around death and dying. The inaugural Dying to Know Day is August 8th, 2013. 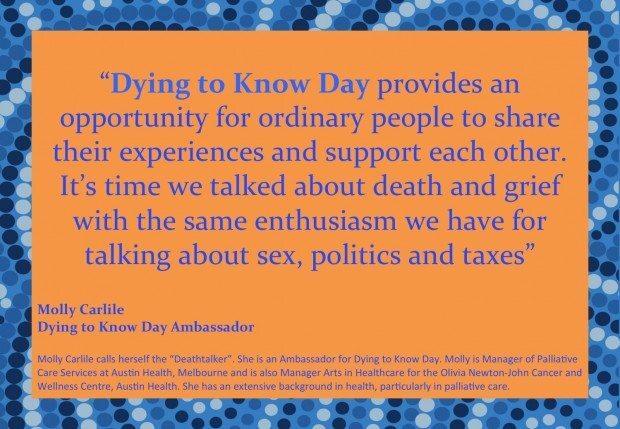 The aim of Dying to Know Day is to encourage all Australians to develop new knowledge and attitudes about how to deal with death and bereavement and support each other at the end of life. Dying to Know Day inspires local initiatives and promotes information to enable all Australians to discuss and plan their wishes. Dying to Know Day is inspired by Igniting Change and their book ‘Dying to Know’. Igniting Change inspires, enables and catalyses ideas for social change and The GroundSwell Project is proud to be linked to this work. 1) Host an event – read the D2K blog for ideas and inspiration & register your event here. 2) Attend an event (details coming) & RSVP for the July 22 launch in Sydney. 3) Stay informed: Subscribe to our updates. 4) Order your Dying To Know books. 5) Join the discussion on Facebook.